We develop and apply a new method for estimating the economic benefits of an environmental amenity. 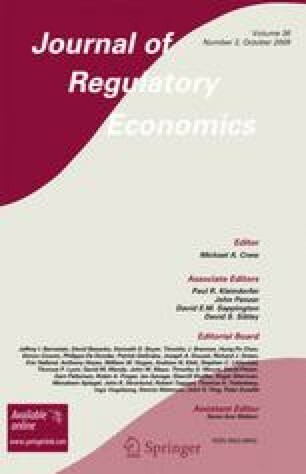 The method is based upon the notion of estimating the derived demand for a privately traded option to utilize an open access good. In particular, the demand for state fishing licenses is used to infer the benefits of recreational fishing. Using panel data on state fishing license sales and prices for the continental United States over a 15-year period, combined with data on substitute prices and demographic variables, a license demand function is estimated with instrumental variable procedures to allow for the potential endogeneity of administered prices. The econometric results lead to estimates of the benefits of a fishing license, and subsequently to the expected benefits of a recreational fishing day. In contrast with previous studies, which have utilized travel cost or hypothetical market methods, our approach provides estimates that are directly comparable across geographic areas. Our findings show substantial variation in the value of a recreational fishing day across geographic areas in the United States. This suggests that current practice of using benefits estimates from one part of the country in national or regional analyses may lead to substantial bias in benefits estimates. Financial support of this work was provided by Resources for the Future, the U.S. Environmental Protection Agency, and the Dean’s Research Fund, John F. Kennedy School of Government. The analysis benefitted from discussions with Andrew Metrick, Richard Newell, and Kerry Smith, and comments from participants at seminars at the National Bureau of Economic Research and Harvard University, and very helpful comments from two anonymous referees. The data set, which builds upon previous work by Wolf (1988), was assembled with the help of a series of research assistants, including: Rod Bender, Nancy Bilica, Alisha Bloom, Diane Cherry, Peter Condon, Andrew Hoffman, and Michael Susanto. The authors alone are responsible for any errors.